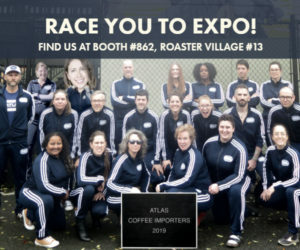 Over the past year, Nossa Familia has expanded its North American footprint beyond its original Portland, Oregon, roastery cafe to a total of five active facilities, including a standalone roastery, one retail shop in Los Angeles now three cafes in Portland. 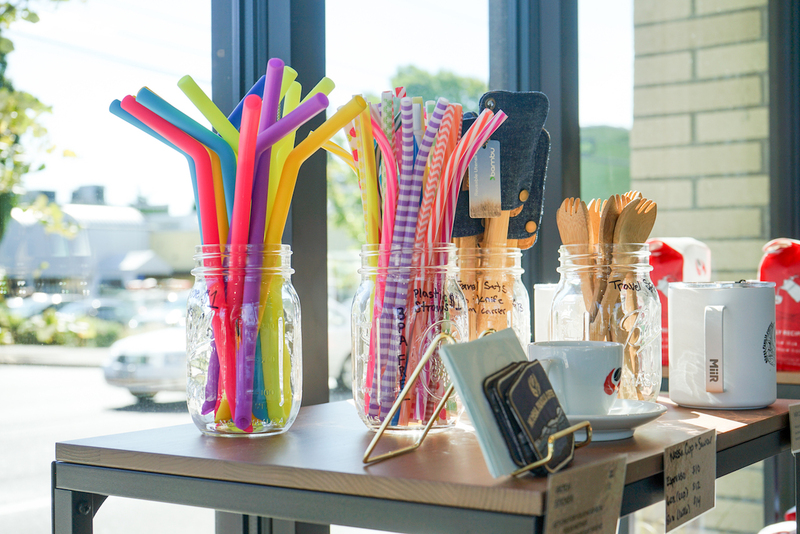 The third Portland shop opened its doors last week, celebrating with free samples of crafty mocktails and free cups of joe to patrons who brought their own reusable cups. 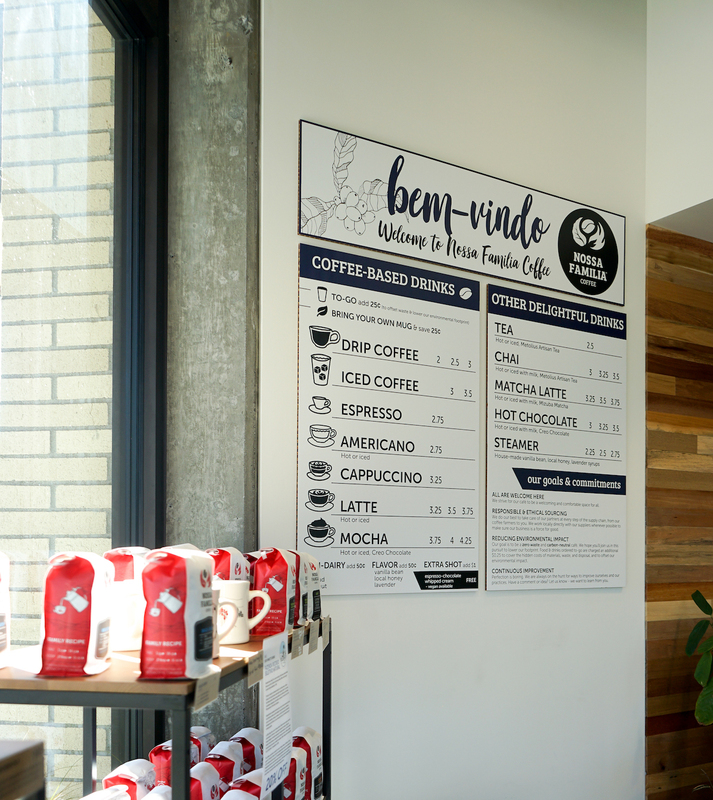 All of the vertically integrated coffee company’s recently opened Portland shops are decorated with origin-country themes. 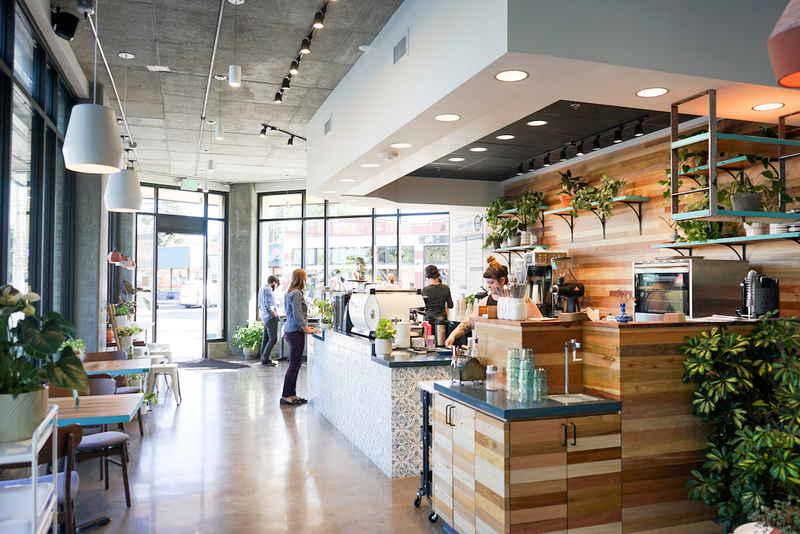 Its Pearl District shop is treated to a Nicaraguan cloud forest theme; its Central Eastside location recalls the coffeelands of Guatemala. This latest one follows suit, but in perhaps the most personally meaningful way so far. It adopts a color and material palette intended to recall the picturesque blue and white farmhouse with terracotta roofing that exists on the owners’ family farm in Brazil. The terracotta pendant light fixtures custom made by local Portland ceramicist Sarah Wolf of Wolf Ceramics hang in front of artwork created by founder Augusto Carneiro’s uncle Teodoro, after whom the company’s Teodoro’s Italian blend is named. The lights’ warm glow illuminates a stylish corner in which the furniture will rotate based on customer feedback in terms of comfort and convenience. 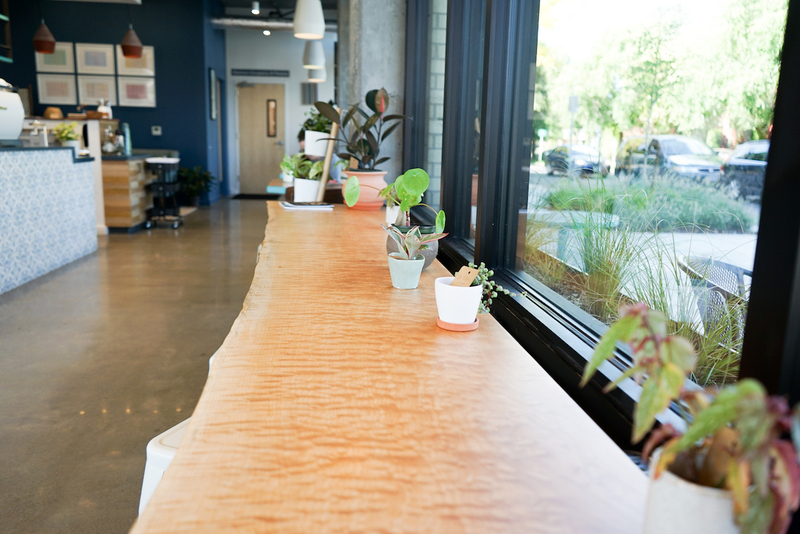 The new shop’s lush, abundant greenery will also likely come and go more frequently than typical coffee shop plants, as these are grown, potted and for sale by one of the shops baristas, whose plant business Nossa Familia is happy to incubate. Select plants were discounted 15 percent for the grand opening. A La Marzocco GB5 espresso machine paired with a Nuova Simonelli Mythos grinder supports the traditional espresso menu, while a Curtis-made machine brews batches of drip, and in the future, a selection of snacks will be on offer, including Brazilian-style offerings like acai bowls and Pão de Queijo (Brazilian cheese bread). “We want to get established here and figure out the space, and then hopefully add more food products and stuff as we go,” said Lickteig. 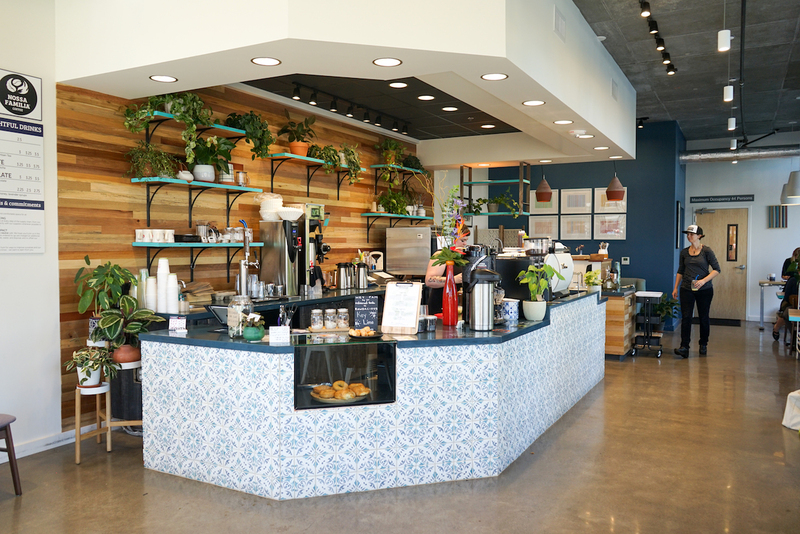 And it is indeed a space that has taken plenty of figuring, as it is the first Nossa Familia location built out wall to wall with ADA-compliant counters, seating and more. The new shop shares a building with Community Vision, a nonprofit provider of individualized support for people living with disabilities. 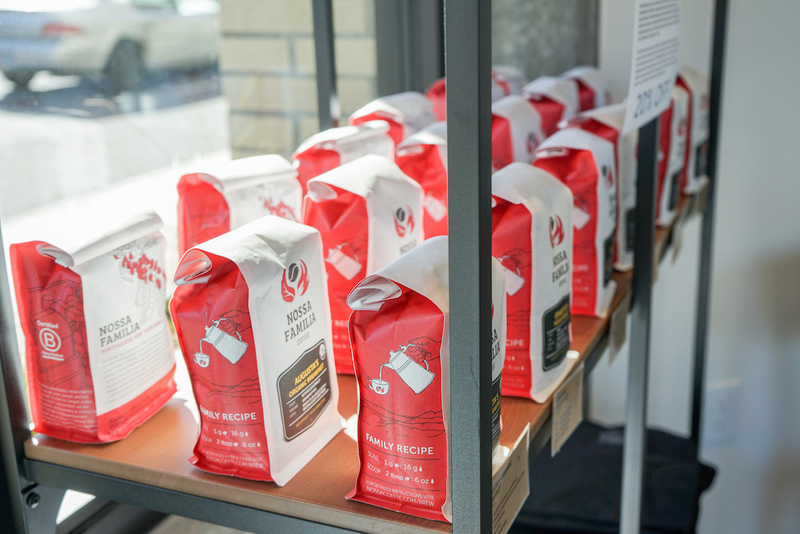 It is one of the largest organizations of its kind in the state, and has and continues to work with the coffee company on the designs of its spaces and offerings. While this of course means all counters and tables are of ADA-compliant height, it goes deeper to include various styles of mugs to accommodate people with difficulties gripping things, a variety of seating both with and without armrests, and more. Cafe Manager Camille Bevans said the lower bar surface is actually beneficial to workers, too, providing a more comfortable tamping height. Meanwhile, another progressive experiment at the new shop is a 25-cent premium for to-go cups and a 25-cent discount for reusable cups. Lickteig noted that while the $.50 swing between bringing a cup and taking one made of paper seems dramatic, having the differently priced option also helps the company track patrons’ choices in records generated by their POS system. That data could inform decision-making regarding other Nossa Familia cafes. At issue is the reality that for many people with disabilities, straw usage isn’t a matter of choice but of physical necessity, and most alternatives are either a step down or are completely unsuitable. Paper straws are considered too fragile, too easily torn by people with limited jaw mobility. Glass, metal, bamboo and other reusable straws can be too rigid for people who require flexibility, and are too hard to clean for people with dexterity issues. Metal is further unsuitable for those who rely on straws for both hot and cold beverages, due to the conduction of heat. And for all people who would rely on them, reusable straws can simply be too easy to lose or forget. The shop continues to do its best to navigate these concerns. For-here straws are metal with removable, flexible silicon tips that Bevans said have happily met the needs of most patrons so far. Baristas are authorized to give away a $1.00 reusable straw on a to-go order if it seems necessary. In one situation where a patron cited the difficulty in cleaning reusable straws regardless of price, Bevans said they offered to clean the straws for that patron if they brought them back to the shop, which Bevans acknowledged was not really a solution to the problem in the long run. The company acknowledges that these efforts are a work in progress. The company’s retail expansion, however, is a work concluded, for the time being. 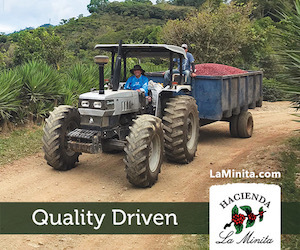 Lickteig said Nossa Familia now plans on giving renewed attention to its origin travel program through which employees, colleagues and anyone from the public is welcome to join on a guided adventure to a coffee growing region. Nossa Familia is now open at 1949 S.E. Division St. in Portland. I’ll be down that way in two weeks, and will stop by.